Acts of violence throughout the world have been fueled by tensions between peoples of disparate cultures, religions, and languages. Finding a way to alleviate ethnic tensions and resolve these conflicts is a big step toward establishing a peaceful world. Typically we see these conflicts analyzed in media and science based on the details of the historical animosities, economic disparities, and social structures in the region. Our research, however, has found a method to accurately predict where ethnic violence will occur, based only on the large scale structure of a society. This insight allows us to predict, but more importantly suggests ways to prevent, ethnic violence. The former Yugoslavia is an important case study. Yugoslavia was formed at the end of World War I as a union of smaller states with diverse cultures. During a period that included severe ethnic violence, the state broke apart in the 1980s and 90s. Many modern day countries exist as similar amalgamations of groups that self-identify as distinct forced together by conquest and colonialism. It turns out that understanding the fate of Yugoslavia has relevance to many other places as well. In our research we found that the key to predicting and preventing ethnic violence lies in ethnic geography . Ethnic geography refers to the places distinct groups of people live in a region. In many cases, people have a natural tendency to settle near others similar to themselves. Mathematically we can show that even if they start from a random spatial distribution (see Figure 1), a desire to live near others of the same type will cause them to form patches that grow in area over time. Regardless of whether the groups are different ethnicities, religions, or languages, there is a fundamental principle that describes the formation of geographic patches. Because this behavior doesn't depend on specific details, it is called "universal." As long as people move around and prefer to be near others of the same type, any area will display the same universal dynamic. Historical peculiarities of a society, including migrations of a group and population displacements can increase this tendency to form patches when a group settles in a specific area. We see such geographic patchworks exist everywhere in the world. Interactions within and between groups depend on that geography. The way groups behave toward each other is determined by how individual behaviors combine and aggregate, a property that is itself related to the way groups are distributed in space, and particularly to the sizes of patches they are part of. How does patch size affect violence? It seems reasonable that there is a specific size of patches where violence will take place. A well mixed neighborhood would correspond to the case when people are fine with living together, or said in the other direction, when people are mixed they know each other as individuals and interactions are not just motivated by ethnic identity. On the other hand, when the patch size is very large, most people don't encounter members of the other groups, so they wouldn't be involved in conflicts. Intermediate patch sizes, patches of a particular size, must be the culprit. We performed case studies in Yugoslavia, India, and Switzerland and found indeed that when patches of ethnic groups are above a certain size, ethnic violence does not occur. When patches are below a certain size, violence does not occur either. These thresholds are approximately above 60 kilometers and below 20 kilometers. This is a natural size, as this range is the longest distance a person might walk in a day. When islands or peninsulas of one ethnic group, surrounded by another group or groups, fall within the critical range then ethnic violence is most likely to occur. Large ethnic patches occur in a well separated or segregated society. Under these conditions it seems that each ethnic group has their own spatial region in which their values, customs, and traditions are expected to apply in public spaces. In a well mixed society, with small patches, no one group has or expects a monopoly over behavior in public spaces. It is in the critical range for violence where expectations about public spaces are violated. An ethnic neighborhood's sense of autonomy is challenged by members of groups in bordering neighborhoods who may regularly pass through public spaces. This friction leads to conflict. Consequently, it is at the interface between these patches that the highest propensity towards violence is to be expected. This suggests that as groups choose to separate there are two solutions to violence: forcing the groups to mix or accelerating the separation until the groups reach large enough size. However, it turns out there is another choice—well defined boundaries that allow for more local autonomy so that groups can determine accepted behaviors in their respective public spaces. We confirmed this by studying Switzerland, an example of a state with generally well defined boundaries . Switzerland has a reputation as a peaceful country, despite a diverse population of Catholics and Protestants and French, German and Italian speakers. In other places these might be in conflict. As Figure 3 shows, without the boundaries there would be a lot of violence. But little violence is predicted once the boundaries are included which is consistent with the reality. Switzerland's ethnic groups are separated by both political borders in the form of cantons that are part of a federal system of governance and physical boundaries formed by the country's natural abundance of mountains and lakes. Still, there is one region where violence was predicted even with the boundaries and in fact has been historically observed. This region occurs near a too easily navigable mountain range between French and German speakers. This violence led to the creation of a new canton, a political border designed to promote separation and regional autonomy. Yugoslavia, as you may recall was not so peaceful. Its internal borders were quite different from Switzerland's. Figure 4 shows the predictions for ethnic violence both with and without borders. There are two areas where the borders do work as in Switzerland. When the model doesn't include the borders around Slovenia and Macedonia we predict violence there, but when it does the prediction of violence is dramatically reduced and it does not occur. However, the presence or absence of borders in the rest of the country has little effect on the geography of violence. This means that these borders are not in the right places. Moving the boundaries would have been a peaceful alternative to the disastrous violence that ensued. In Yugoslavia, strong centralized governments including the dictator Tito's socialist regime may have succeeded in suppressing ethnic conflict for a time, but ultimately violence broke out. Local autonomy is not a new idea; examples of federal governance include not just Switzerland's cantons but also the United States of America, which has four levels: municipal, county, state, and federal governments. A well integrated society is considered by some to be ideal. Efforts to form boundaries and separate conflicting groups are often viewed negatively. Our results, however, suggest that in many cases partial separation is a constructive alternative to severe violence. Historically, attempts at separation failed because they didn't consider that there is a patch size where boundary creation is critical. For example, the separation of Pakistan and India left the patchy area of Kashmir that is the site of ongoing violence. Northern Ireland is similarly patchy. Sub-national boundaries, when aligned with natural communities, can reduce ethnic tensions and prevent violence. Self-governance at the municipal or district-level can offer communities a measure of autonomy and allow for peaceful coexistence. Such boundaries are not needed if people choose to integrate or exist in large enough patches. If Yugoslavia had shifted its subnational boundaries, it might have looked a lot more like Switzerland. As we consider the many places in the world where patchy ethnic areas are the locations of friction, conflict, suffering, death, and refugees, the recognition of a way to achieve peaceful coexistence can provide better alternatives. We can also consider the idea of patches as a kind of respect for individual differences. Respecting individual differences enables each person to contribute their own strengths to a society. Complex systems adopts a multiscale perspective. In this view, groups of various sizes are like individuals contributing to the global society that we are all part of. Respecting group decisions about public spaces and giving them the local autonomy to do so may be part of this respect. The idea of self-determination is already a principle that is widely discussed for inter-group relationships. Given the death and suffering caused by ethnic violence, it is important for us to identify places where people are in patches. Instead of forcing people to move so that they are mixed or separated, introducing new boundaries can enable peaceful coexistence. The natural tendency to self-aggregate can be leveraged for peace if communities are given proper borders and self-governance over their own neighborhoods. FIG 1: Simulated dynamics of separation of types that prefer to be near members of the same group (A through E).  The patches grow in size and retain the same shape (curves that lie on top of each other in F are measures of the shape). The average size grows as the cube-root of time, a power law [inset of (F)]. Patches of a certain size are highlighted by red shading in (A) to (E), appearing mostly in (C) and (D). We identify such regions with a high likelihood of conflict. FIG 2: (A) Census data from 1991 shown here in map form were converted into a spatial, agent-based representation shown in (B). Our prediction of populations likely to be in conflict with neighboring groups [red overlay, (C) and (D)] agrees well with the location of cities reported as sites of major fights and massacres [yellow dots, (D)]. FIG 3: Ethnic groups and topographical boundaries in Switzerland. 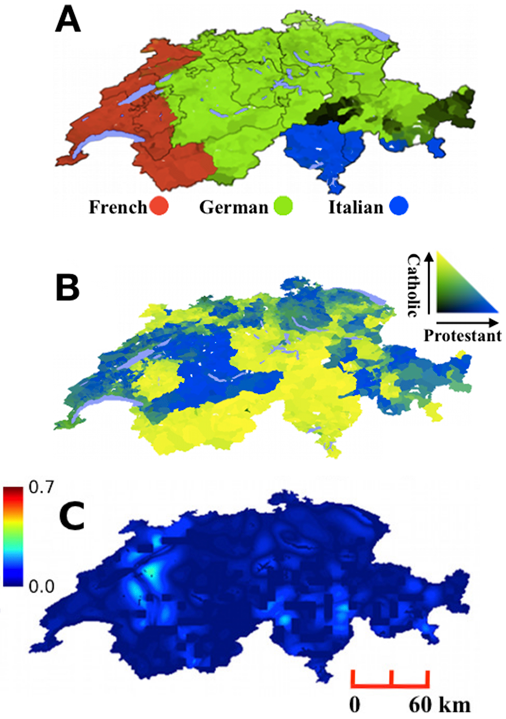 Maps of Switzerland showing proportion of (A) linguistic groups and (B) Catholics and Protestants according to the 2000 census. (C) Calculated propensity (color bar) to violence between linguistic groups with the inclusion of topographical features as boundaries using a characteristic length scale of 24 km. Mercator projection. The distance scale is approximate. FIG 4: Ethnic groups, political borders, and topographical boundaries, in the former Yugoslavia. (A) Map of the area of the former Yugoslavia showing administrative provinces. Propensity to violence calculated without (B) and with (C) administrative boundaries, using a characteristic length of 21 km. Locations of boundaries are shown on both plots as solid and dashed yellow lines respectively. Sites of reported violence are shown as red dots. Spurious violence is predicted along the borders of Slovenia and Macedonia when boundaries are not included. Province labels are: SL: Slovenia, CR: Croatia, VO: Vojvodina*, B&H: Bosnia & Herzegovina, SR: Serbia, MN: Montenegro, KO: Kosovo*, MA: Macedonia. (*Autonomous administrative provinces of Serbia. ).